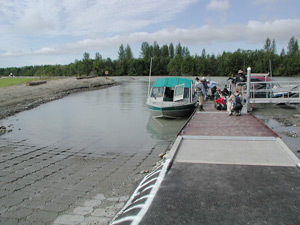 The Susitna Landing boat launch site was originally constructed in the 1970's. During the mid-1980's, ADF&G learned that the site and surrounding property was for sale. This project provided the funding necessary to conserve state-owned riverfront uplands. Susitna Landing is located near the confluence of the Kashwitna and Susitna rivers at approximate river mile 61 of the Susitna River. The Landing provides access to a multitude of tributaries in the Susitna River drainage. There are a wide variety of sport angling opportunities available to those launching out of the facility including fishing for king, silver, red, chum, and pink salmon as well as Dolly Varden, rainbow trout, Arctic grayling and northern pike. 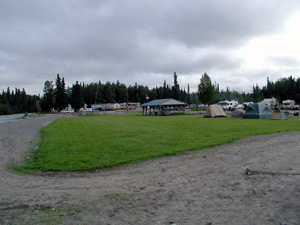 The project objective is to conserve state-owned riverfront uplands within the property boundaries of the Susitna Landing Boat Launch by designing and constructing erosion control structures and providing landside amenities for motorboat users and bank anglers who choose to stay at the landing for more than just the day. ADF&G completed this project in the summer of 2007. 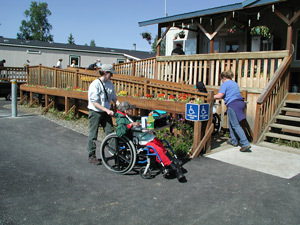 The improvements include riverbank restoration/stabilization in the form of riprap, cobbles, bank access stairways, and vegetation; completion of three camping loops and new electrical RV hook-ups within two of the loops; road improvements and overflow parking; an ADA-accessible concrete vaulted toilet building and accessible shower building; picnic tables, fire rings, landscaping, fencing, manual and electric gates, and a new septic system. 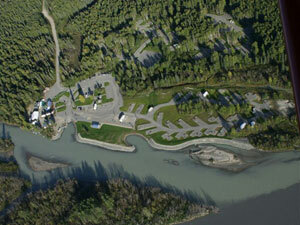 The Susitna Landing Boat Launch is an ADF&G-owned facility. A state contracted private concessionaire provides day-to-day operation and maintenance of the site. Over the years, DSF has made numerous improvements to the site that includes buildings, sanitation facilities, ADA accessibility, parking, hardening of the boat launch ramp and a boarding dock. The facility now provides a double lane boat launch ramp, RV and tent camping, fish cleaning tables, accessible trails, and boat trailer and vehicle parking areas.